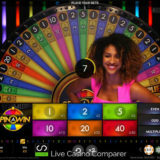 Playtech has re-launched Live Spin a Win, a wheel of fortune style game aimed at Live Casino players. The first version was released at the turn of the year, 2018, but was taken down after complaints that the game didn’t appear to be that “live”. It’s true, the game that was launched was controlled by an RNG engine and the technology just wasn’t up to the job. Playtech did the right thing thing and pulled the game. 3 Months later, version or mark 2 has been released. Out has gone the RNG technology, in has come a new manual wheel and everything now looks rosey. For more information read my full Playtech Spin a Win review. In a nutshell Live Spin A Win is a Wheel of Fortune type game, where players bet on which number a wheel spun by a dealer will stop at. It’s sort of like roulette but with a vertical wheel, rather than horizontal. 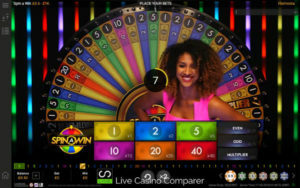 It has less numbers but more segments than a Roulette wheel – 53 as opposed to 37 in European Roulette. It sounds complicated but it’s not, honestly. 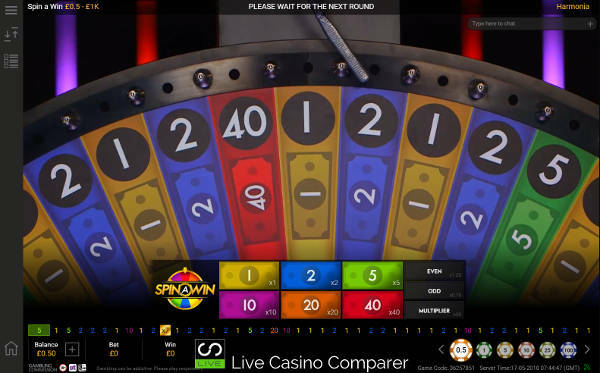 How do you Play Live Spin A Win? Like roulette you can bet on as many numbers as you like. 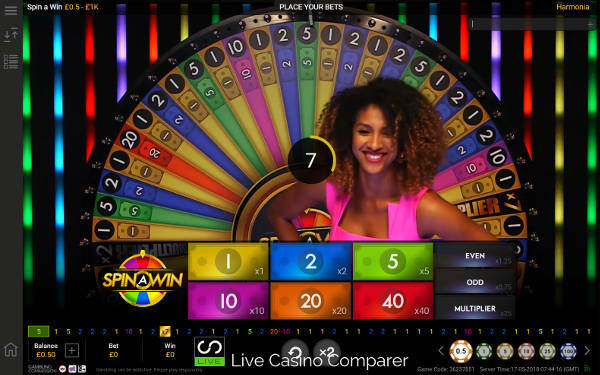 There are 6 numbers and each number has a different Pay Out value, which is determined by the number of times it appears on the wheel. 1 appears 23 times and pays 1:1. 2 appears 15 times and pays 2:1. 5 appears 7 times and play 5:1. 10 appears 3 times and pays 10:1. 20 appears twice and pays 20:1. 40 appears once and pays 40:1. There is two Multiplier segments that increase the payouts by 2x and 7x when hit. It’s the multiplier part of the game that turn something straightforward into something that can deliver huge wins. Bets can be placed on individual or multiple numbers. There are also 3 Side Bets. These can be played on their own, or alongside the main bets. You bet on Odds which pays 0.75:1, Evens 1.25:1 and Multiplier 25:1. 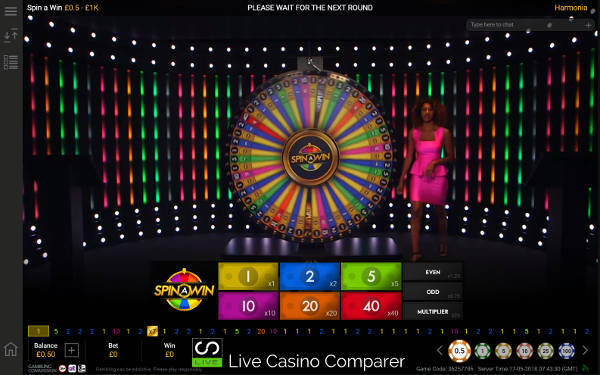 There are 30 Odd numbers and 21 Even numbers on the wheel, which explains the different payouts. The documents RTP for the game ranges from from 90.67% up to 97.22%. The 97.22% RTP is achieved by playing the Odd Side bet. All other bets have a lower RTP. Is this version of Live Spin A win any better? The wheel action is smooth and the strop settles nicely to pick the winning number. If you think you’ve seen this game before, you’re right. There’s no mistaking that it looks exactly the same as Dream Catcher from Evolution. But, there are a number of differences between the two games, that should give players a great choice. I prefer the presentation style of Dream Catcher at Evolution, but I like the side bet options on Live Spin a Win. Will it be a success? I’m sure it will. At the moment I’ve only seen Live Spin A win at Betfred. I looked around my usual Playtech haunts and it wasn’t there yet. t can only be a matter of days before we see it at Bet365 and Betfair. But until then Betfred is the place to head to.